Random and probably a dumb question, but when im looking for LS swap parts online, majority of stuff is labeled as LS1.. 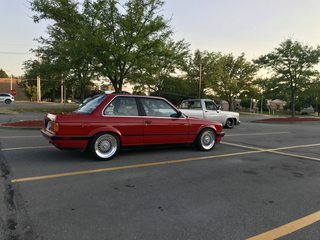 If im looking to do an LS2 or LS 3 swap, will those same LS1 parts fit on the e30 swap or do i need to find specific LS2 or LS3 parts? Obviously the wiring will matter when i get to that point. Using a z3 steering rack will work with the LS2/3 just like the LS1 right? Garagistic seems to have all the LS1 parts, just wondering if they are gonna be compatible with the LS2/3. I have a 85 325e that has just recently been gutted, engine and transmission pullled, waiting for the sandblasting shop. Going to take care of all the suspension, brakes and subframes before i go into the engine and transmission swap. Should be fine, I think it's the truck motor that has different mounts from the LS, any actual LS should have the same mounting. Someone correct me if I'm mistaken. As far as swap kits go it doesn't matter if its a LS1, LS9 or anything in between. Just be careful if your using a truck block, I've heard they have different mounting points. I've personally myself haven't ran into this problem. I'm using a truck block (LC9) mounts like any other LS engine. Using a Z rack will be fine. All "LS" series engines have the same mounting points (not including front wheel drive versions). The difference lies in the accessories, intakes, heads, etc. However, the mounting points are different from the older generation "SBC" found pre 97. I recently finished my ls2 swap. I used sikky parts for my swap and I also use a z3 rack. This was my first time ever doing anything like this and it wasn't too bad. I used a wiring specialties pnp harness and they should be running a black sale soon. This is incorrect. Truck blocks don't have the front mounting holes that the aluminum blocks have.